When it comes to content management, both Netflix and educational publishers know how difficult it is to organize their data. Both handle massive amounts of data every day, and each is under pressure to deliver the right content to the right user. However, Netflix stands apart from most educational publishers, thanks in part to their massive adoption of AI (artificial intelligence). So what can Netflix teach content managers who work in the publishing industry? A lot, actually. In this blog post, we’ll detail how Netflix’s content recommendation engine benefited from AI and three lessons content managers should take away from their success. Why Did Netflix Adopt AI? Netflix knew from the beginning that AI would help push their company forward. As early as 2006, the company was creating contests for developers with the goal of creating the best way to deliver content to their users. Market research uncovered that users felt overwhelmed with the enormous amount of choice that is available on Netflix. While consumers want to have as many options as possible, the reality is that they often got frustrated trying to sort through Netflix’s vast content offering. On average, users would browse 10-20 titles for 60-90 seconds, investigating 3 titles in depth, before either choosing a program to watch or giving up entirely. That 90-second window is short, shorter than Netflix expected. And if users repeatedly hit that 90-second mark without finding something to watch, it’s enough to prompt them into canceling their subscription. Since Netflix prides itself on giving viewers the opportunity to close their account at any time without hassle, they found they were losing big business because of this short 90-second time frame. Instead of changing how difficult it is to unsubscribe, Netflix introduced artificial intelligence to improve their platform. Now when users turn on their TV or open their computer, they’re presented with a screen filled almost entirely with recommendations for content to watch. These content recommendations come from AI-powered algorithms. The AI scans the metadata about a show that a user has watched, then combs Netflix’s content database to find other content that is similar. It then presents that customer with a list of related content that is tailored to personal viewing habits, making finding an interesting show to watch significantly easier. Now when customers browse for 90 seconds, the content that they find is significantly more relevant to their personal tastes, and they are more likely to be happy with the service. Netflix estimates that this AI initiative saved the company an average of $1 billion (USD) every single year in lost subscriptions. The media producer also estimates that roughly 80% of what an average consumer watches originates as a recommendation, not from searching. In short, AI enabled Netflix to strike the right balance between giving consumers the freedom to choose what they want while also reducing the overwhelming “choice stress” many experienced. 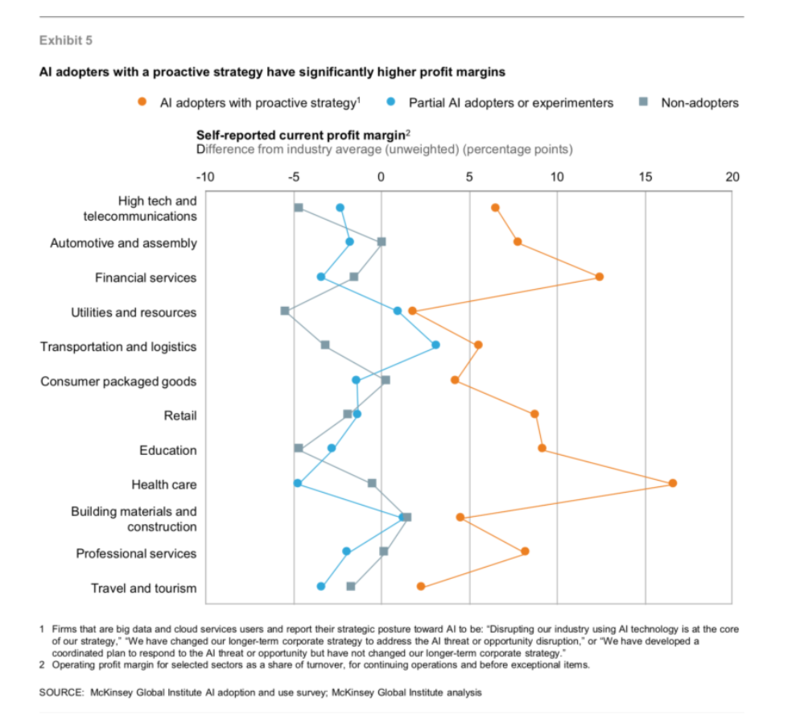 McKinsey discovered that when it comes to AI adoption, companies need to go big early on. AI is not an easy installation, and it does cost a reasonable amount to implement it. But thinking of artificial intelligence as a long-term profit-boosting investment rather than a cost-saving short-term solution is crucial to successful adoption. Netflix has been very successful with their AI investment because they went big. It took a leap of faith to justify spending millions of dollars and countless hours developing bespoke business tools that would boost their profitability. In the end, they weren't even sure that it would pay off. The benefits of AI have been enormous for Netflix, and the company is better equipped to continue adopting AI solutions now that the infrastructure is in place. Their systems are now already “AI-friendly,” so they will more easily adapt to technology changes in the future. Publishers no longer have to wait for AI to start modernizing their content. Starting with a small proof of concept to tag metadata of educational content is possible, thus delaying AI implementation should no longer be an option. A 2017 McKinsey report discovered that successful early adopters of AI experience 3%-15% higher earnings than their competitors. Graphic source: McKinsey. Even though publishers and Netflix are in radically different industries, there is still a lesson in Netflix’s adoption of AI: keep investments focused on the end user experience. Netflix invested their money into personalized recommendations so that they would boost customer satisfaction. By helping users watch their favorite content online, they propelled themselves forward as the leading online-streaming service. students and school districts—both of which are now, arguably, relying more on technology than traditional textbooks. The demand for smart content management solutions continues to rise, yet publishers still hold off on investing AI technology that would serve their end users best. By making investments with the needs of end users in mind, publishers can make smarter choices about where they put their time and energy. Netflix didn’t walk into AI implementation blindly. They did years of research on their consumers, corporate process, and more before they made serious investments. The massive payoffs were nice, but they also expected it. Publishers need to do the same when it comes to their AI adoption. A strategic plan is critical to convincing C-level executives of the long-term value of AI as well as dissuade fears about adoption. Meeting the technology needs of students and schools comes down to smart content management. As the foundation for learning, organized educational content can be repurposed, synthesized, and implemented in extraordinary new ways. The benefits of AI doesn’t need to be limited to Netflix’s content recommendation model. By studying how Netflix uses AI and applying it respectively to publishers’ content needs, publishers will see dramatic returns on investments that AI brings. Ready to take the leap into smart content management? With 360AI, you’re well on your way to a faster and more agile content management system that will automate your metadata tagging with better accuracy.